1. Preheat the oven to 200°C, gas mark 6. Place the potatoes and oil into a roasting tin, toss to combine then season. Bake for 15 minutes. Add the onion, tomatoes, balsamic vinegar and rosemary, mix, then return to the oven for a further 10 minutes. 2. 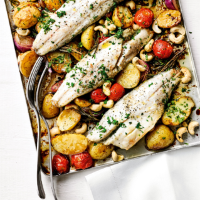 Season the sea bass, add to the tray of vegetables and cook for another 8-10 minutes, adding the cashews for the last 4 minutes until the fish is just cooked and the nuts are golden. Serve immediately with the parsley scattered over. This recipe was first published in Thu Aug 03 10:26:29 BST 2017.